Wall Street loves meat this year. Friday's entree: Brazilian steak. Fogo de Chao, the Brazilian steakhouse chain, debuted Friday morning to salivating investors under the ticker "FOGO (FOGO)." It priced its IPO at $20 Thursday night -- well above its expected price range -- and the stock jumped almost 29% Friday, ending the day at $25.75 a share. 2015 is shaping up to be the year of the yummy IPOs: Fogo de Chao, which is listed on the Nasdaq, is the fourth restaurant chain to score big on opening day with investors. Shake Shack (SHAK), Bojangles (BOJA) and Wingstop (WING) all had successful IPOs this year with big bounces on their first day of trading. Unlike the others, Fogo de Chao is the only foreign-born food concept to find widespread appeal. Then again, a menu that has 11 different meat options -- "Hi yes, I'll have the beef tenderloin wrapped in bacon" -- isn't a hard sell to American customers or investors. While Fogo de Chao's 29% gain Friday is strong, it isn't king among foodie IPOs. Shake Shack soared 118%, beating all others, followed by Wingstop (60%) and Bojangles (25%), according to Renaissance Capital. Canadian tea company DavidsTea (DTEA) also had a solid debut this month, popping 42%. Founded in 1979 in Porto Alegre, Brazil, Fogo de Chao has expanded rapidly in Brazil and United States over the past decade. It has over 30 locations in the U.S. and Brazil. It's now based in Dallas and run by CEO Lawrence Johnson, a former lawyer who took over the company in 2007. Fogo de Chao pulled in $262 million in revenue last year, a nearly 20% jump from the prior year. The restaurant has big ambitions for growth. The chain's owners believe they could open as many as 100 new U.S. locations, though don't offer a time frame. They plan to expand more in Brazil, and collaborate for joint ventures in Asia, Australia and Europe. In May, Fogo de Chao opened its first joint venture restaurant in Mexico City, according to company filings. 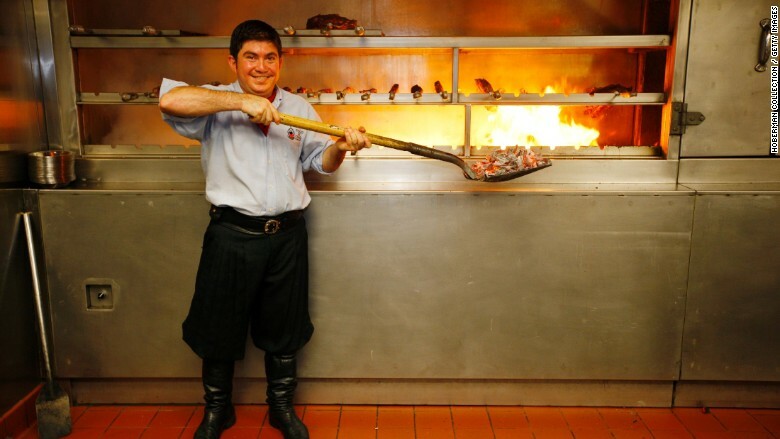 Fogo de Chao specializes in gaucho-style cooking, which is South America's version of cowboy cuisine. The meat is known for its high quality because almost all South American cattle is grass-fed.